without the pressure of xmas being in the way. you can enter up to 3 times. start in a couple of weeks (6 weeks off woooohoooo). ~ and coffee-ing with friends at the beach-side cafes. and this gorgeous stamp that I bought recently. Then I came across a brilliant tutorial here by Leandra at PaperArtsy! The rest just fell into place as I went along. ~ so it was a great opportunity to just have a play. And I absolutely love the vintage feel that the crackle background gives. I still struggle with the embellishment side of things. And admire those that use them so skillfully! to add a pop of white to blend in the white seagulls. but the frantage does remind me of something else. That’s just part of summer too I guess! Thanks Kaye for passing on the shells to me rather than throwing them out. They finished this off so well. There you have it…a relaxed beach scene, Dot’s style! A fabulous summer scene Dot, I love how you have made this lovely lady stand in the rock pools with the gulls and the crackle background is brilliant. Loving your summer scene,especially when we are having frosty mornings. Its a fantastic vintage beach scene. Relaxed beach scene Dot style does it for me babe. You are the absolute best when it comes to making anything different. Your imagination when it comes to designing is second to none. Fabulous holiday card and I love the vintage look. The added seagulls and little shells are lovely touches. Thank you for joining us at ATSM. Wonderful card for the holidays! We also have the sunshine, but not so warm! Love the added seashells and crackling, so perfect for the sea goer! Happy Sunday! Fabulous card, great summer feeling. That really is a fabulous stamp and I love your colors! Thanks for joining us at Inkspirational! One of my favorite CI images. Love the scene you've created! Thanks for joining in at Inkspirational! Completely gorgeous, Dot – the colours are right up my street, and I love the frame and the weathered crackle – brilliant! 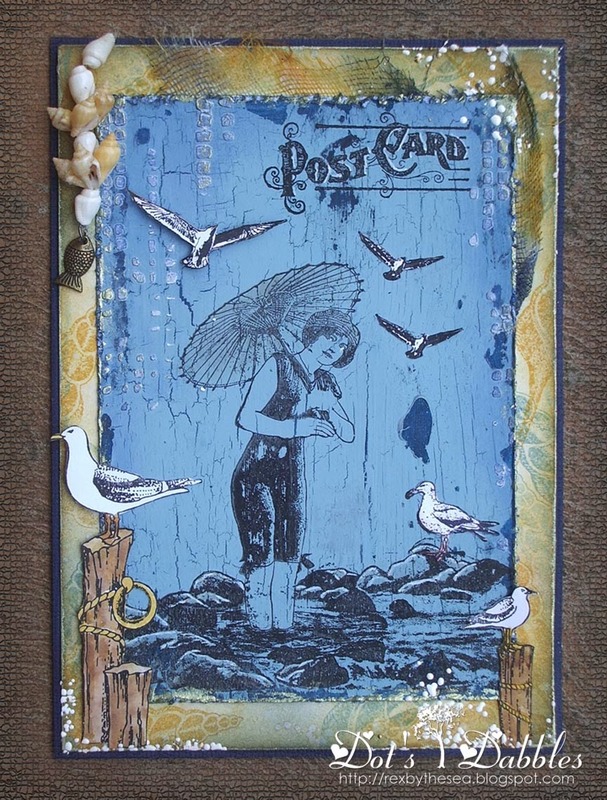 Hi Dot, just catching up – Love this summer scene with its vintage/crackle background.Love how you've brought the scene out onto the card.